Get an introduction of Bangalore in the most offbeat and engaging way. We will cover the various aspects living in Bangalore including the busy markets, local food, temples and historically significant places. This is one of our most popular tours in India. Ideal for people seeking to get a glimpse of Bangalore’s history and cultural richness. This Bangalore walking tour will give you the chance to absorb the sights, sounds and flavors of Bangalore’s historic market place “pete”. You will also have the chance to watch the lively exchange between local residents and stall owners at the flower market, buy fresh local produce from fruit vendors and savor delicious snacks from hidden gems in the market. Learn about Bangalore’s 500 year history and its connection to the world. Visit beautiful South Indian temples and engage in conversation about religion and spirituality. The tour starting point will be at the State Bank of Mysore entrance gate on Avenue road. The tour ending point will be at Tipu’s summer palace. There will be no pickup and drop off for this experience, please arrange to be at the start point on time. Learn the history of Bangalore and the story behind how it was founded. Walk through the 150-year-old charming flower market, which will be a treat for your senses. After a brief introduction, we will stop at different places to taste food and engage in conversation as we head towards K.R. Market. At K.R. Market we will explore the flower, fruit and spice stalls. 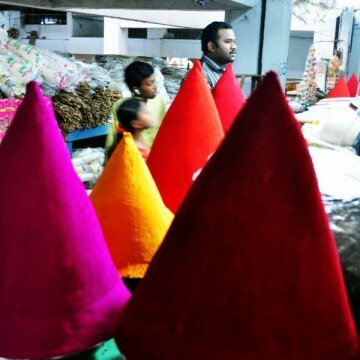 The market is full of rich colors and smells, which will give you a great opportunity to take pictures. Further south is the Bangalore Fort and Tipu’s Palace where Tipu Sultan battled the British general Lord Cornwallis. We will then end the tour with a visit to 320 year old temple built in the Vijayanagara style. We booked this tour based on the other reviews from Trip Advisor and were not disappointed. Arjun, our guide for the tour, took us off the beaten track to discover Bangalore's hidden treasures. The tour of the markets was amazing, with beautiful sights and sounds and interaction with local vendors, with Arjun helping us buy some local spices along the way. We also loved the final part of the tour where we walked to the historical sites and learnt about the history. Our favorite part of the day would have to be Arjun taking us to have the best Dosa and Mango juice we have ever had! This is a must do tour which gives a great insight to the city of Bangalore for not only travellers but locals also! Bring water bottles and a hat. Wear comfortable shoes because we will be walking close to 3 kilometers on this tour. Entry fee and snacks in the market are included in the fee.